A mysterious force from a parallel universe wreaks havoc on a small town as a scientist fights to stop it from taking over the world! In Deadly Voltage, you'll find yourself in an abandoned city with only your wits to guide you and a bizarre invention clamped around your wrist to protect you from the surges of electrical power that crackle in the air. As you follow the prodding of an eccentric scientist, who's hiding in his laboratory across town, you'll make your way through empty streets, an abandoned toy factory and more, searching for clues and solving puzzles that take you one step closer to a "shocking" revelation. Slowly, you'll come to realize a powerful entity known as the Invincible is using the local power grid and production facilities to take over the minds of the townspeople and amass an army of robots. It seems unstoppable, but it failed to factor two things into plans: The ingenuity of the human mind and the resolve of the human spirit! 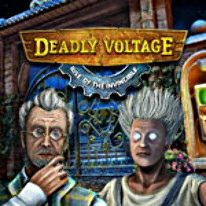 With its dazzling animation, super-charged gameplay and electrifying story, Deadly Voltage is a hidden object adventure for all ages! Plug in today!